In a fast pace world what better way to slow down than to try some slow cooking. Winter is here and comfort foods become more prominent on the menu. There’s nothing like a big pot of something bubbling away on the stovetop on a cold winter day. I wasn’t really sure what was going to be on the menu today but knew I would get my inspiration once I arrived at the market. Will it be a soup, or a stew? And then it came to me; oxtail soup. I hadn’t made that in quite some time. I usually bring a grocery list with me to make sure I don’t forget something because farmers markets and food stores are just as tempting and distracting as kitchen stores. I always end up buying extra items (that’s a given) or my already planned menu will change to something completely different. At least a list will generally keep me focused on what I actually need at home for the week or for the dinner party that I’m planning. NOTE: If you like your soup chunky, cut your vegetables thicker. If you like smaller pieces, dice them finer. Soups should be enjoyed how you like them ~ rustic or refined. Just make sure your pieces are all relatively the same size and/or thickness. 1. Trim excess fat from oxtail pieces. Heat a deep pot (4.8 litres/5 quarts), add 36-53 ml (2-3 tblsps) olive oil and brown oxtail pieces. Take your time and don’t overcrowd the pot. This is where you begin to create your flavour for the soup and you don’t want to start off with a burnt flavour. Remove meat from pot and set aside in a bowl. 2. If the pot looks too dry, add another 1-2 tblsps of olive oil. Add the chopped celery, onions, carrots (the trinity of flavours for most soups or stews) and garlic to the pot and cook until tender (approximately 10 minutes on medium heat). 3. Add thyme, chopped parsley and stir in wine to deglaze. Add beef stock, bay leaves, chopped tomatoes and tomato paste. Return browned oxtail to pot along with any juices that may be in the bowl that you had the meat in. 4. Bring pot to a boil then reduce heat and simmer uncovered for 2 hours. Skim fat occasionally from surface. Liquid will reduce and flavour will intensify. After 2 hours, remove any thyme stems and discard. 5. 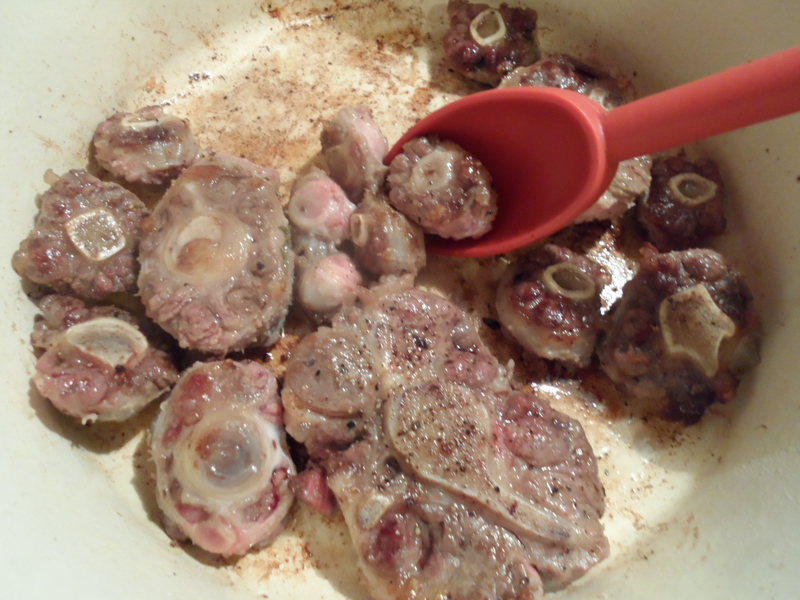 Remove oxtail from pot and pull meat from bones. Return meat to soup and discard bones. What you end up with is a dark rich soup filled with chunks of meat. Add your favourite pasta noodles, rice or barley and simmer until they are cooked before you are ready to serve. Don’t put them in at the beginning of the 2 hour simmer or they will really be overcooked. Mushrooms or diced zucchini would also be great additions to the pot. Serve with your favourite crusty bread and enjoy! Posted in beef, main course, recipes, SoupsBookmark the permalink.